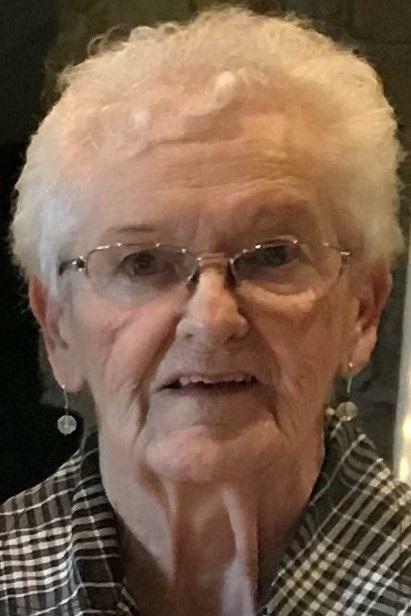 Caddie, 81, passed away peacefully Saturday, October 6, 2018 at the Victoria General Hospital, Halifax, surrounded by her loving family. Born in MacAdam’s Lake, Caddie was the daughter of the late Dougal and Belle (nee Harrietha) Currie. Caddie was an extremely faithful woman. She loved going to bingo and was an avid dart shooter. Caddie was a well-known Avon representative for many years. She loved to knit, making dish cloths, afghans and scarves. Over the years, Caddie worked as a secretary for several New Waterford doctors. Caddie loved spending time with her family, especially for birthday and holiday celebrations. Caddie is survived by her husband of 54 years, Archie; daughter, Arlene; sons, Raymond, Bradley (Gail) and Jeff (Jennifer); grandchildren, Travis (Kyla) Durdle, Dylan, Kyle, Andrew, Aaron, Kaisey (Jordan) and Jeffrey; brothers, Michael, Jimmy (Shirley) and John (Lizzie); sisters, Theresa MacLean and Cecilia Gosbee (Ray); sisters-in-law, Bonita ‘Bunny’ Marcella, Peggy Currie and Theresa Currie. Besides her parents, Caddie was predeceased by her siblings, Mary Pickup, Flora MacMullin, Christina MacInnis, Katie Mae, Angus Joe, Dan, Francis ‘Buddy’; brothers and sisters-in-law, Foch Pickup, Claude MacMullin, Michael MacInnis, Tommy MacLean, Sally Currie, Rhodena Currie. Visitation will be held on Wednesday, October 10, 2018, 2-4 p.m. and 7-9 p.m. at McLellan Brothers Funeral Home, Plummer Avenue, New Waterford. Funeral Mass to celebrate Caddie’s life will be held on Thursday, October 11, 2018 at 10 a.m. in the Parish of Saint Leonard, Mount Carmel Avenue, New Waterford with Father Ray Huntley officiating with a luncheon to follow at the KOC, Plummer Avenue, New Waterford. Internment at St. Mary’s Cemetery in East Bay. In lieu of flowers donations can be made to The Friends of Nora’s Home through the Parish of Saint Leonard. To send online donations to the family go to www.mclellanfuneralhome.com.